Pride Shockwave 2006 had the potential to be one of the best cards of the year, and it didn’t disappoint. 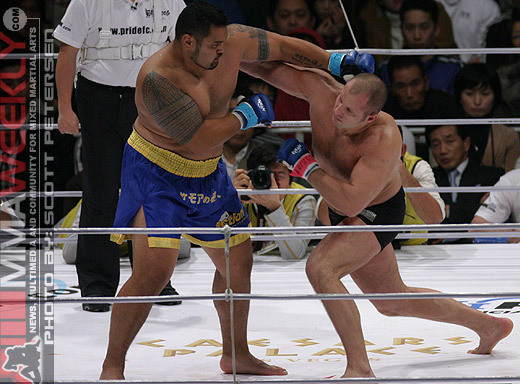 In the main event, Pride Heavyweight Champion Fedor Emelianenko retained his title with a submission victory over Mark Hunt. The two fighters approached each other cautiously with Hunt throwing low kicks. Fedor clinched off of the ropes and threw Hunt down, landing in a full mount position. Emelianenko attempted an armbar but Hunt was able to escape. At one point in the fight, Hunt attempted to submit Fedor two times with a keylock but was unsuccessful. Although he was a bit tentative, it was a decent showing by Hunt. The New Zealander would eventually succumb to a kimura in the first round. In a highly anticipated rematch between two world-class heavyweights, Antonio Rodrigo Nogueira put himself back into title contention with a unanimous decision over Josh Barnett. Both fighters were content to stand and exchange early on. The rematch wasn’t quite as entertaining as their first encounter but nonetheless is was still a great fight. Nogueira displayed an improved ground-n-pound while Barnett’s conditioning wasn’t quite up to par as his previous performance. After Nogueira was announced as the victor, Barnett nodded in agreement with the decision. 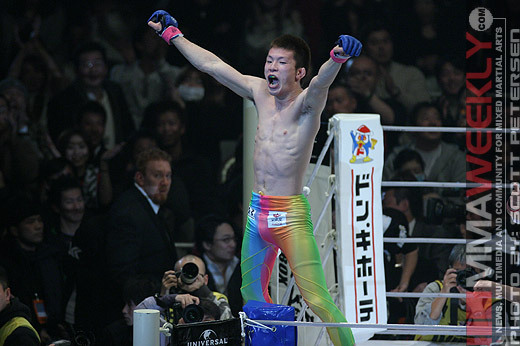 Pride Lightweight Champion Takanori Gomi defeated Mitsuhiro Ishida with strikes in a non-title fight. Playing into Gomi’s game, Ishida decided to stand with the champion early on and throw kicks. The “Fireball Kid” countered one of the kicks with a left hook, sending his opponent to the canvas. Ishida tried to pull guard afterwards but was unable to recover from the punch. After many unanswered strikes, the ref halted the bout in the first round. Two new lightweight superstars emerged as Gilbert Melendez and Shinya Aoki were able to pick up victories over the highly ranked Tatsuya Kawajiri and Joachim Hansen, respectively. 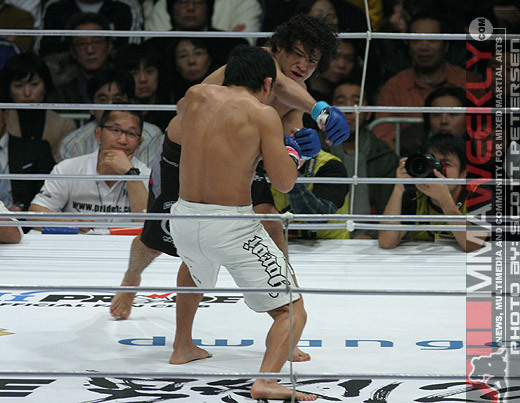 Shooto Welterweight Champion Tatsuya Kawajiri took on undefeated Gilbert Melendez in a highly anticipated match-up. Kawajiri dropped Melendez early with a right hook and the first round had many exciting exchanges. Both fighters displayed great wrestling skills and fans enjoyed competitive transitions. The “Crusher” defended Melendez’s takedown attempts well and scored a few takedowns of his own. In the second round, Kawajiri seemingly got the better of Gilbert on their feet, beating him to the punch on many occasions. In the end, the judges awarded Gilbert the unanimous decision and the elated Melendez knelt down on the mat. Although Melendez was consistently more aggressive, the T-Blood fighter landed more shots, defended takedowns, and got more takedowns on his opponent. Regardless, this was the best fight of the evening and an easy candidate for Fight of the Year. In one of the most anticipated fights of the night, former Shooto Champion Joachim Hansen squared off against current Shooto 167-pound Champion Shinya Aoki. Hansen threw a kick early that was caught by Aoki. The Scandinavian fighter would subsequently lose his balance and allowed Aoki to control the fight from that point. The Brazilian Jiu-Jitsu black belt used his ground prowess to submit Hansen in the first round with a gogoplata. 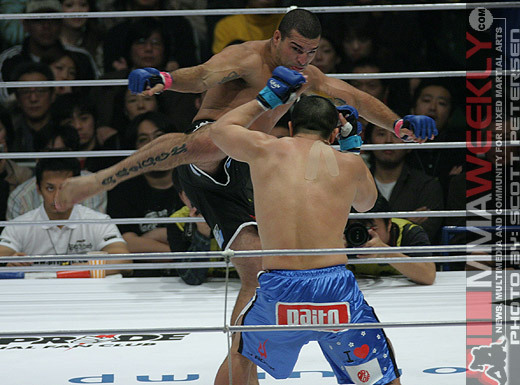 The 2005 Pride 205-pound Grand Prix Champion Mauricio “Shogun” Rua earned a unanimous decision over Kazuhiro Nakamura. Rua controlled most of the fight, scoring takedowns and attaining full mount on different occasions. Nakamura wasn’t able to take advantage of his Judo background but did defend Rua’s many submission attempts well. The Judoka had spurts of punching flurries but his offense was negated by Rua’s clinches and subsequent takedowns. Nakamura seemed exhausted after the fight. James Thompson defeated Olympic Gold Medalist Judoka Hidehiko Yoshida in a sloppy yet entertaining fight. Yoshida controlled Thompson on the ground early, making a few submission attempts. After the fighters stood back up, the two proceeded to exchange punches. Foolishly, Yoshida refused to back down as Thompson got the better of the exchanges. 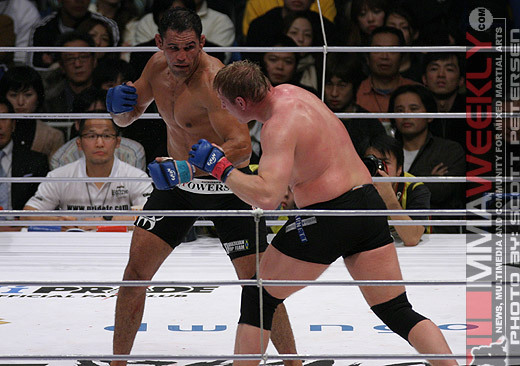 Seemingly out on his feet on a few occasions, Yoshida was unable to intelligently defend against the “Colossus” on the ground, prompting the ref to stop the fight in the first round. Thompson pulled off the biggest upset of the night after and gained a much needed victory. Former Japanese Pro Wrestler Kazuyuki Fujita had an easy night, as he defeated MMA newcomer Eldari Kurtanidze. Fujita landed an uppercut that caused the Georgian wrestler to fall face first to the mat. “Iron Head” followed up with a few strikes and kicks causing the ref to stop the fight. Akihiro Gono redeemed himself with a dull win over Yuki Kondo in their rematch. Kondo was the aggressor throughout the match, moving forward and engaging his opponent. Gono did a good job at fending Kondo off and landing a variety of kicks. Unwilling to over-commit, the fight turned into a tentative chess match with neither fighter landing any significantly clean shots. Known as a slow starter, Gono gained more confidence and momentum as the fight went on. After two rounds, Akihiro Gono earned a split decision over the King of Pancrase and avenged his loss. 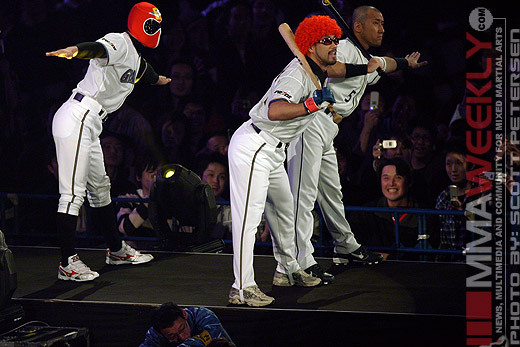 Apparently abandoning his DJ Ozma entrance routine, Akihiro Gono and his crew appeared wearing baseball outfits while walking out to music by Jay-Z. Halfway down the aisle, a famous Japanese baseball player joined them. DJ Ozma’s ‘Age Age Every Night’ began playing shortly after and the group performed another classic choreographed dance routine. It’s too bad that the fight wasn’t as entertaining as the intro. 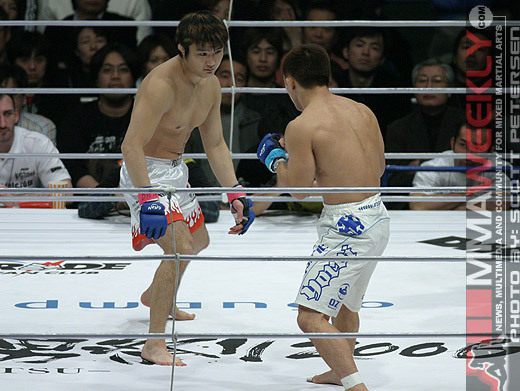 In the opening fight of the evening, Ikuhisa Minowa and Kiyoshi Tamura faced off in a rematch from their first encounter in 2002. The strangely charismatic Minowa entered the ring sporting sunglasses while his opponent wore an ‘I Heart U’ U-File T-Shirt. Tamura engaged with his usual left low and mid kicks while Ikuhisa leaped in with his punches. At one point, Minowa charged in and was countered by Tamura’s knee, stunning the fighter. It seemed as though Minowa may have suffered a rib injury or had the wind completely knocked out of him. “The Punk” went down on the mat and ref stopped the fight after some unanswered kicks from Tamura. Overall, Shockwave was a great event and produced some excellent fights. Takanori Gomi was back to his old self with an impressive stoppage of Mitsuhiro Ishida. Shinya Aoki proved that he could compete against top opposition with a dominant submission victory over the always tough Joachim Hansen, and it would seem that the win will push Aoki into the top ten rankings. This has been a difficult year for Pride, and it’s nice to see the year end on a positive note with an entertaining show.